We have all seen the posts on social media from disgruntled customers ranting about a product or service that didn’t quite meet their expectations. Some luggage got lost as they made their way to a Hawaiian vacation, their food had a hair in it, or the latte they ordered had a temperature of 148 degrees rather than their desired 150. Small businesses and large corporations alike are now available online through social media, making it easier than ever to communicate. Everything from responding to vocal, irritated customers to answering common questions consumers have about your product or service can be streamlined through some best practices, as we explain below. 86 percent of consumers quit doing business with a company because of a bad experience. 51 percent of consumers said they would give up on a purchase after trying to reach customer service only once. On average, consumers tell 9 people about a good experience, where they tell 16 about a negative one. 8 out of 10 U.S consumers said they would pay more for better customer service. 78 percent of online customers recommend a brand to friends and other contacts after a great customer experience. 80 percent of companies think they are delivering superior customer service, where only 8 percent of customers think these same companies are doing so. While these stats reference general customer service experiences, your social media customer service strategy is a large part of contributing to these overall sentiments. When specifically discussing social media customer service, the term “social care” is widely used. As Soul of Brands shares, “More than half of social media users under the age of 45 engage in social care,” which is probably why you can remember seeing a post from your angry uncle on Facebook about his phone company overcharging him for his data usage. Social care is not only being used by young digital natives, but is consistently utilized across all ages, languages, genders, and income levels. The following social media customer service examples and tips can help guide you along towards maximizing your social care efforts. To remedy this on platforms like Twitter, set up search streams through your Hootsuite and account for misspelled variations of your business name, or for keywords that might have relevance to your business. This way you have the best chance of catching mentions and discussions of your brand, and can therefore address them as necessary. Purina then would tweet directly, when appropriate, to those discussing the brand, allowing a real-time, one-on-one connection with customers and their audience. With this social care focus, Purina have seen a 100 times greater use of their @Purina Twitter handle, a response rate of 86 percent, over 5,5000 personalized Tweets sent in response to users, 6.5MM personalized quality impressions, and equity measurements which have skyrocketed. In order to deliver the best social media customer service like Purina, it’s important to know how and where you can add value. Appropriateness is key, and businesses need to recognize the ways in which their consumers are using social media with a customer service purpose, and then build a strategy around these findings. Are your customers using Twitter to seek help, or do you have a dedicated Facebook group for them to do this? Furthermore, if it is help that they are seeking, position yourself as easily reachable and keen to build relationships and engage. With the real-time nature of social media, customers are expecting responses aligned with this timeliness. While this differs slightly from one social media network to the next, it’s always a good idea to respond as quickly as you can to a customer’s request. We all know how annoying it is to have to wait on hold for customer service phone support, and online experiences are not too different. Social media customer support expectations are even different from email, where a 24 hour wait period is standard. According to a consumer research study by Oracle, “more than half of consumers on Facebook expect a same-day response to questions and posts, where 52 percent of consumers using Twitter expect a company to respond within two hours.” Furthermore, the study found that 30 percent of Twitter users expect a response within half an hour—meaning that in order just to meet many of your consumers’ expectations you should be listening and participating in social media consistently. 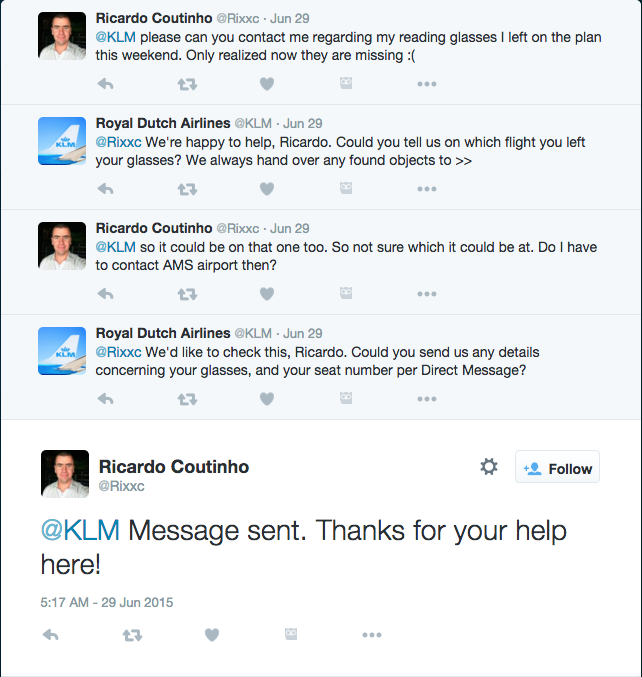 A company who goes above and beyond, both literally and figuratively, is Royal Dutch Airlines (KLM). They have a very active Twitter account where they respond to customer inquiries, but what truly sets them apart is that they put their estimated response time in their Twitter header. This is updated every five minutes without fail, enabling a sense of transparency and setting the expectation for their customers. Including their Twitter account, KLM’s customer service page states that the company has 24/7 service via social media channels such as LinkedIn and Facebook. Here, they encourage customers to book or change flights, check-in, choose a seat, order a meal, arrange for extra baggage, or post any other question whether or not they have booked a flight with KLM. This dedication to social care is significant from not only a customer sentiment standpoint, but a financial aspect. As VentureBeat explains, “Social business leader KLM, the airline that kickstarted the modern customer-support-via-social-media revolution, has 150 people dedicated to serving clients via social. And each of them represents almost $170,000 in annual revenue.” KLM’s social media manager Gert-Wim ter Haar emphasized this point to VentureBeat, saying “Social is more and more becoming a profit center. It’s first about service, then brand and reputation, but also about commerce. We have to make money.” Seems like social media customer service makes both dollars and sense.